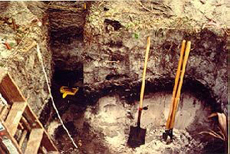 From 1993 to 2007 Florida archaeopedology research was conducted by Sylvia Scudder, now retired. Scudder’s studies employ analyses of chemical and grain-size characteristics to answer questions about site configuration and settlement patterns, environmental changes such as sea level rise, and post-depositional alterations in site structure. Chemical analyses include determination of pH, organic carbon and total phosphorus content, and content of acid-extracted elements such as calcium, magnesium, potassium, iron, aluminum, copper, and zinc. Particle-size distribution analysis is used to quantify changes in soil texture. Soil morphological descriptions include horizon arrangement, thickness, and boundaries; color, texture, structure, and inclusions such as roots, artifacts, and animal burrows. All of these data are used to compare anthropogenic deposits with native (non-human-influenced) soils to determine site boundaries and interpret site use. Figure 5-3. 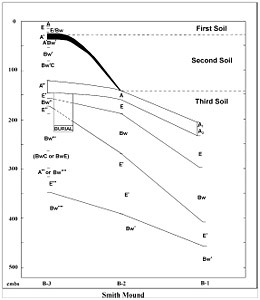 Profile of Smith Mound showing stacked soils and soil morphology from each of the three units, B-1, B-2, B-3; cmbs is centimeters below surface. Diagram by Sue Ellen Hunter, courtesy University of Florida, Institute of Archaeology and Paleoenvironmental Studies. (Excerpt from Introduction, p. 81-82) One aspect of archaeological research that is particularly important to interpretations of cultural history and social relationships explores the management of labor and materials required for the construction of monuments, especially of burial mounds. 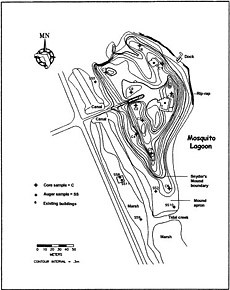 The Pineland Site Complex, on the east coast of the Gulf of Mexico (Figure 5-1), features monumental earthworks, hand-dug canals, and rich black-earth and shell middens covering approximately 25 ha (Luer 1991:71; Marquardt 1992a). Generations of archaeologists have focused on cultural interpretations of Pineland’s platform mounds, canals, lakes, and sand burial mounds (Cushing 1896; Luer 1989; Widmer 1988). Cultural and environmental evidence demonstrate that this architectural complexity, and associated social complexity, was supported, not by farming, but by the rich, natural mosaic of local, nondomestic resources (Marquardt 1987, 1988, 1992b; Scarry and Newsom 1992; Walker 1992, 2007). Thus, the evidence from this site runs counter to widespread archaeological assumptions that such complexity could only be supported by domesticated food sources. Elaborating upon the construction activities at Pineland demonstrates that the relationships among monumental construction, social complexity, and food acquisition systems are more complex than presumed in earlier centuries. In this case study, soil morphology as well as chemical and physical soil characteristics testify to the complex and labor-intensive construction history of site. In particular, the study confirms the local origin of the soils used to construct Smith Mound and indicates that the human burial associated with the mound was interred many years before the mound itself was constructed. Figure 2. Soil core and auger sample localities, Seminole Rest site. Sedimentological and faunal studies at the Seminole Rest archaeological site on the Atlantic coast of Volusia County, FL, addressed the question of whether construction of the large shell mound at the site began on dry land or in the shallow waters of Mosquito Lagoon. Particle-size analysis defined a sand body beneath the hardshell clam mound, which is bordered by mucky tidal marsh and the shallow, silty lagoon. 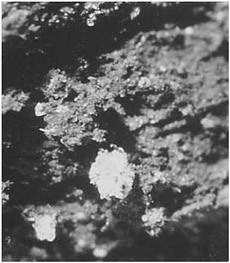 Weathered kaolinite, hydroxy-interlayer vermiculite, and gibbsite clays in the sub-mound sediments, identified by X-ray diffraction, contrasted with the ‘shrink-swell’ smectite clays of the tidal marsh and mound periphery and corroborated the particle-size evidence of a sand bar or bank. The presence in the sub-mound sediments of articulated valves of the diminutive Brown Gem Clam (Parastarte triquetra, Family Veneridae), and their absence in the silty marsh sediments, presented another line of evidence for a sand body beneath the mound. Parastarte is a common inhabitant of shallowly submerged sand bars. The existence of articulated valves of all size classes below the mound argues for a thriving population of the clams in their preferred habitat at the onset of mound deposition, which would have begun in the shallow water adjacent to the shore and not on dry land. Soil chemical and physical analyses were conducted at the Blueberry site (8HG678) in Highlands County, Florida, to address two questions: 1) the relationship between a sand-buried Belle Glade Period midden (A.D. 1410-1455) and a much older but more superficially situated Archaic Period (4500-2500 B.P.) fiber-tempered locus, and 2) the nature and origin of the charcoal-laden sand layer covering the Belle Glade midden. A significant increase in coarse sand and the condition and quantity of organic carbon deep in the central part of the site imply that the area was formerly a stream or seep drainage separating the two older, more stable landforms that supported the archaeological deposits. Soil morphology, color, and chemistry, and charcoal and organic carbon distributions present evidence of past cycles of area-wide fires, episodic erosion onto the site from adjacent higher sand ridges, and partial recovery of the vegetative cover in the intervening periods between fires. 439-440: The Page-Ladson site (8JE591) is one of a cluster of related sites being examined by a team of researchers for the Aucilla River Prehistory Project. Located beneath the waters of the Aucilla River just below its confluence with the Wacissa River in Jefferson County, Florida, the site is composed of mineral and organic strata of Pleistocene and Holocene age. Near the top of the excavated column in Test Pits C and F is a dark brown silty clay loam, dated to approximately 10,000 yr BP and laden with organic matter, wood fragments, and shell (Stratum 2A, Chapter 3 by Kendrick). The discovery of Bolen-period artifacts on Stratum 2A, the dark brown Bolen layer, raised the question that the level might have been at one time the surface of a terrestrial soil that served as a living area for Paleoindians. Figure 15.4. Calcium sulfate crystals, Page-Ladson Stratum 2A. Photo by Aucilla River Prehistory Project. 448-450: The objective of this study is to categorize Stratum 2A – the Bolen layer – as either a terrestrial soil or an unweathered sediment. Implicit in the first possibility is the assumption that if 2A was at one time a subaerial soil, it served as an aboriginal living area and the artifacts found on its surface are in situ remnants of human occupation. The second possibility – that it is an unweathered, submerged sediment – renders the habitation hypothesis untenable and calls for an alternative explanation for the presence of the artifacts. 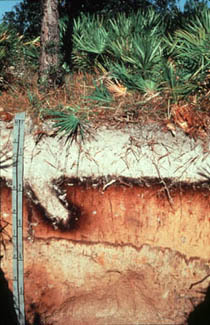 457: Standard soil analytical techniques, faunal identifications, and microphotography were applied to Stratum 2A – the Bolen layer – and related sediments at the Page-Ladson site in Jefferson County, FL. These analyses resulted in the characterization of Stratum 2A as a shallowly submerged sediment and not the surface horizon of a drowned terrestrial soil. Strong support for this characterization came from the lack of evidence of pedogenesis within the Bolen layer and among adjacent strata, and from the identification of intact, diminutive freshwater vertebrates and invertebrates from sediment samples. The extreme heterogeneity of Stratum 2A and the habitat requirements of its infauna suggest that it was covered by shallow, slow-moving water, received intermittent pulses of organic and mineral inputs, and was constricted or protected enough to act as a trap for fine silt- and clay-sized sediments. The cultural artifacts found on the surface of the Bolen layer were probably deposited by colluviation-tumbling into the water from habitation sites on the slopes above, or thrown in by Paleoindians who frequented the water source. Scudder, S. J. (1996) Ch. 4 In Case Studies in Environmental Archaeology. E. Reitz, L. Newsom, S. Scudder (Eds. ), Plenum, New York, pp. 55-69. (Excerpt from p. 55, 64) The investigation reported herein is part of a multidisciplinary study evaluating human settlement and subsistence patterns on Horr’s Island, Florida (Russo 1991). The investigation characterizes and contrasts anthropogenic soils of three cultural periods with local native soils and soils buried below the midden in order to evaluate human impact on the soil environment. […] The most obvious physical effects of piling midden debris onto the well-sorted fine sands of the Horr’s Island dune were changes in grain-size distributions and changes in color. Changes in soil texture were most apparent in dark-earth living areas, which were characterized by highly fragmented shell, charcoal, and bone material that showed clear signs of heavy foot traffic and compaction. Natural or intentional area-wide fires were the most likely contributors of layers of coarse and finely fractured charcoal that blackened the naturally yellow dune sand. Fine sand blown in continually from the surrounding area by aeolian input blended with these materials, creating an anthropogenic epipedon of mixed particle size and dark color, strikingly different from the soil buried beneath. Abandoned living areas were mantled with aeolian sand as the dune continued to grow, giving the appearance of intentional interlayering of clean sand as the middens were re-inhabited at a later date. 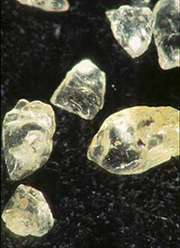 The origin of these sand layers was debated by Alan McMichael (1982) and Michael Russo (1991). McMichael evoked a ceremonial or intentionally human-deposited interpretation, a ritual “cleaning” or purification of the surface in preparation for future habitation. Russo’s characterization of the layers as windblown is supported by their asymmetrical profile–they are banked against the windward flank of the midden–and by the absence of inclusions. The layers are composed of extremely well-sorted fine sands and contain no cultural material, plant fragments, or invertebrate fauna such as that found in sand from the small beach areas along the shore.